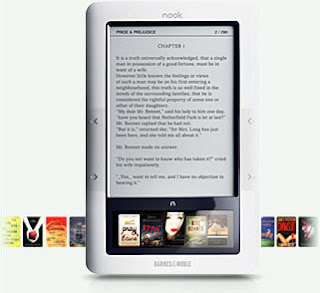 The Un-Official Blog of Romance Author Maddie James: Barnes & Noble unveils new eReader: The Nook! Move over Kindle and Sony, there is a new eReader on the block. His name is Nook and you can make friends with him right now at Barnes & Noble. Romance readers are huge buyers of eBooks, so it is no surprise that romance authors and readers are becoming fans of eBook reading devices. I know many of us read on our Blackberries, Smart Phones, and IPAQs. Others read from their laptop (me). And still others love a dedicated eReader. I, for one, have been lusting after a dedicated device for a while now. I may have just met my new eReader. Nook, come to Mama. So in case you are Christmas shopping early, Ms. Romance Reader, here is a breakdown of the three popular dedicated eReader devices on the market right now. Touted by Barnes & Noble as the worlds most advanced eBook reader, you can pre-order it right now for $259 with free shipping. The reader is not yet available. Besides having access through AT&T’s wireless 3G network or on Wi-Fi to over a million book titles, you can access newspapers and magazines, as well as thousands of free eBooks. The E Ink display makes reading easy and customizable. As it comes you can store up to 1500 eBooks and you can purchase a memory card to upgrade. There are features such as picture and text storage and designer covers. See the Barnes & Noble website for more detailed information. The latest generation (U.S & International wireless) Amazon Kindle now sells for $279 and also uses a wireless 3G network to download books directly into the device from Amazon. It also sports the E Ink, customizable display. Lightweight and portable, as is the Nook above, this Kindle is said to hold the same number of books, about 1500, with access to over 350,000 titles, plus newspapers, magazines and blogs. There are three versions of the Kindle available and prices range from $259 to $489. Visit the Amazon Kindle store for specifics on each version. The comparable version for Sony is the Reader Touch Edition™ which currently sells for $299. It can hold up to 350 books without an expansion memory card, which can be purchased. Books can be accessed via Sony’s eBook store or through Google’s public domain titles, and supports multiple file formats. The Reader Pocket Edition™ is also available for $199 and a Reader Daily Edition™ is coming soon. More information about Sony’s Reader devices can be found on its website. So there you are. Ready to shop? Go!